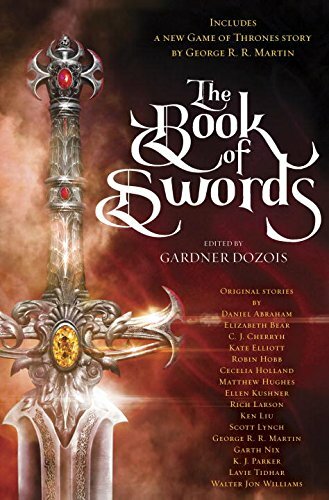 For all you fans of sword 'n sorcery, and/ or my own 'fake histories,' the new anthology from Gardner Dozois, THE BOOK OF SWORDS, has been scheduled for release on October 10, and is now available for pre-order from Amazon https://www.amazon.com/Book-Swords-Gardner-Dozois/dp/0399593764 and many other online booksellers. I imagine your favorite local bookseller is taking orders too. This is NOT one I co-edited with Gargy (people keep getting that wrong), so I haven't read any of the other stories yet, but it looks to have a helluva lineup, with originals by Lavie Tidhar, Daniel Abraham, Scott Lynch, C.J. Cherryh, Robin Hobb, Ken Liu, Cecelia Holland, Walter Jon Williams, and many more. And of course it also includes "Sons of the Dragon," a chronicle of the reigns of Aegon the Conquerer's two sons, Aenys I Targaryen and Maegor the Cruel, for those who cannot get enough of my entirely fake histories of Westeros. That one has never been published before in any form, though I did read it at a couple of cons. No publication date has been set yet, but it's likely that we will get the first volume of FIRE AND BLOOD out in late 2018 or early 2019. The second volume, which will carry the history from Aegon III up to Robert's Rebellion, is largely unwritten, so that one will be a few more years in coming. Meanwhile, you'll have Gardner's anthology to fill the time. Keep your swords sharp!